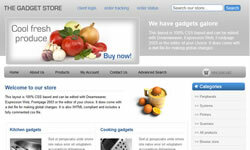 These are Dreamweaver templates with our shopping cart software already integrated into them. The ecommerce software behind all the Plus versions is the same so the difference in price is purely down to the front end design. Compatible with Dreamweaver 3, 4, MX, 8, CS and CC, they use Dreamweaver's dwt file for making global changes, extensive use of CSS and the front end is XHTML valid. Following purchase you will receive a zip file which includes the template, shopping cart software, png files and the CSS based control panel for managing your store online. If you prefer to use your own design with our shopping cart software then you may want to check out our Generic version. There is a developer license available if you plan on setting up multiple stores and we offer Responsive Designs and Premium Responsive Designs that adapt to browser window size, device and orientation. These can also be edited in Dreamweaver and include the dwt file.